Only 50 days until STRAY!! Wash, cut in half and core apples. Slice into thin slices. Put apples, water, 5 tablespoons of sugar and lemon juice in a pot and bring to a boil. 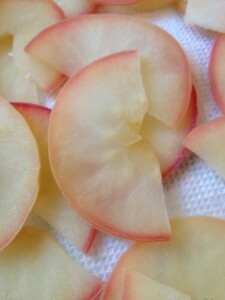 Remove from heat and strain apples. Let cool. Cut puff pastry into strips. Mix remaining 3 tablespoons of sugar, cinnamon and lemon zest together. Spread over the puff pastry. 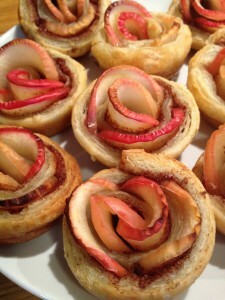 Lay apple slices on strips of puff pastry and roll tightly to create rose-shape. Each strip will use approximately 3 apple slices. 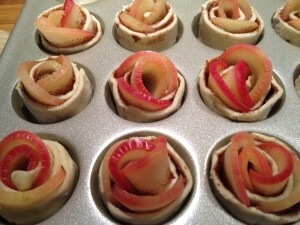 Place rolled pastry onto baking sheet. I used a non-stick mini-muffin pan that worked perfectly, but any baking sheet (with parchment paper) should do. 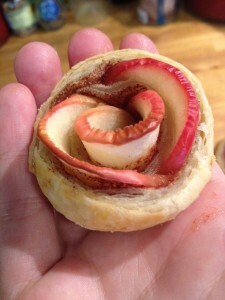 Bake for 25 minutes or until pastry has been lightly browned.